An India Space Research Organisation PSLV rocket (Polar Satellite Launch Vehicle) launches seven satellites from the Satish Dhawan Space Centre in Sriharikota, India, on Feb. 25, 2013. The rocket carried an ocean-monitoring satellite for India, two tiny space telescopes and an asteroid-hunting spacecraft built by the Canadian Space Agency among its payloads. This story was updated at 9:50 a.m. ET. A rocket carrying seven new satellites, including the first spacecraft designed to hunt huge asteroids and two of the world's smallest space telescopes, launched into space Monday (Feb. 25) from an Indian spaceport. The Indian Polar Satellite Launch Vehicle blasted off at 7:31 a.m. EST (1231 GMT) from the Satish Dhawan Space Centre in Sriharikota, India, on a mission to deliver its muti-national payloads into Earth orbit. Monday's rocket flight primarily aimed to launch the new ocean-monitoring SARAL satellite into orbit for the Indian Space Research Organisation and French Space Agency. The satellite is the first in a series of satellites created by ISRO to image the Earth, conduct space science, and carry out oceanic and atmospheric studies, ISRO officials said. An artist's illustration of the NEOSSat asteroid-hunting satellite in Earth orbit. The Canadian Space Agency mission will search for large asteroids near Earth and track space debris. Several other payloads rode piggyback on the PSLV rocket, including the $25 million Near-Earth Object Surveillance Satellite (NEOSSat), a small spacecraft designed to seek out large asteroids in orbits that may stray near the Earth. "NEOSSat will probably reduce the impact hazard from unknown large NEO’s [near-Earth objects] by a few percent over its lifetime, but is not designed to discover small asteroids near the Earth that may be on collision courses," NEOSSat co-principal investigator Alan Hildebrand of the University of Calgary wrote in a statement. Two smaller nanosatellites developed in Canada also hitched a ride into orbit alongside SARAL and NEOSSat in what their builders have billed as the world's smallest space telescope mission. The twin satellites make up the BRIght Target Explorer (BRITE) mission, which includes two tiny cubes, each just 8 inches (20 centimeters) across and weighing less than 15.5 pounds (7 kilograms). The satellites are expected to study the brightest stars in the night sky by measuring how their brightest changes over time. The compact satellites were designed at the Space Flight Laboratory at the University of Toronto Institute for Aerospace Studies. One of the satellites was built at the laboratory while the other was assembled by a partner team in Austria, university officials said. "As their name suggests, the BRITE satellites will focus on the brightest stars in the sky including those that make up prominent constellations like Orion the Hunter," university officials explained in a statement. "These stars are the same ones visible to the naked eye, even from city centers. Because very large telescopes mostly observe very faint objects, the brightest stars are also some of the most poorly studied stars." The two BRITE nanosatellites are part of a planned constellation that is expected to eventually number six satellites in all once complete. Another Canadian satellite was launched today as well. SAPPHIRE, Canada's first military satellite is a small spacecraft designed to monitor space debris and satellites within an orbit 3,728 to 24,855 miles (6,000 to 40,000 kilometers) above Earth. The satellite is expected to augment the U.S. military's existing Space Surveillance System. "It is with great pleasure that I announce that Canada’s Sapphire satellite has been successfully launched," Defense Minister Peter MacKay said in a statement. "Sapphire is a sound investment that will help safeguard billions of dollars of space assets, in fields such as telecommunications, weather, search and rescue, and global positioning systems." Cordell Grant putting the finishing touches to the first BRITE satellite at UTIAS-SFL. The tiny nanosatellite, designed to study the brightest stars in the night sky, is one of seven spacecraft launching on India's Polar Satellite Launch Vehicle C20 mission on Feb. 25, 2013. AAUSAT3: A small science satellite developed in Denmark and built by students from Aalborg University. STRaND-1: The first smartphone-powered satellite ever launched into space. The Android phone that functions as the satellite's brain will run four apps that will take photos from the satellite, test the Earth's magnetic field, monitor the health of the satellite, and allow people around the world to upload videos that will play in space on the phone. 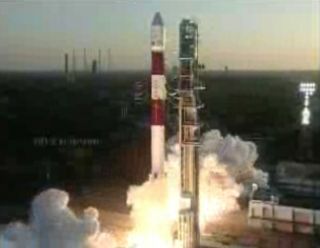 Monday's Polar Satellite Launch Vehicle C20 mission is India's first rocket launch of 2013.